Yes, it's a problem. Every time I visit the flip house I think "ok. no more. We can move forward." And then I walk around and see little things here and there. This week, it was a bit bigger "thing". When we did the furr down for the duct work, the framer put a hole in the wall. After seeing there was no insulation on the master outside wall, we figured there probably wasn't any in the second bedroom. We were right. Nick and I discovered there was no insulation on the exterior walls of the house. The hall and hall bath. The view from the main entrance. How is that for open walls? The good thing? We know everything behind those walls and the electrician could get to everything - which he did and.... WE PASSED ELECTRICAL INSPECTION!!! Let me tell you, I was a little nervous because the electrical in that house should have caused it to burn to the ground! I'm serious. We had to redo all of the electrical in the house to make it safe and bring it to code but I'm so glad we did. I couldn't live with myself if I sold someone a home that could kill them. Have I mentioned yet that there was an electrical outlet in the master shower??? No joke. Funny story - my cousin Colton and I struggled with some of the demo because our arms were spent. We called over Nick (Colton's brother) and he killed it! He had the brilliant idea to use a stud for leverage and knocked it all right out. So with all of the sheetrock open I finally felt like I could see the vision. But the subfloor. It had a particle board layer on top and it was just gross. 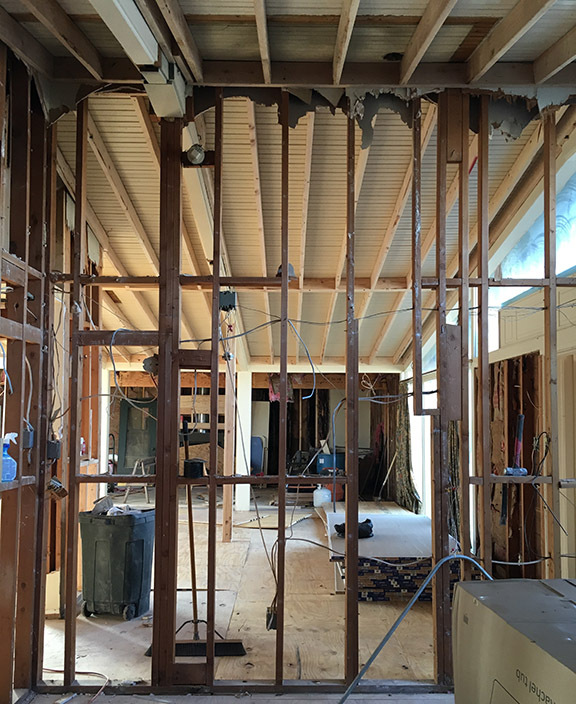 My amazing framer sent his crew over and they replaced every bit of the particleboard subfloor. It made such a huge difference! The new 3/4" plywood is solid and creates a great base for the new flooring. Woo hoo! New, solid subfloor!! I know it may not seem like much, but even the subfloor being changed made such a huge difference. The other thing that made a difference was putting in a 3' x 3' window in the master bathroom. It has a skylight, but needed a bit more natural light. It looks smaller in pics than in person (mainly because the old window cutout was 6' x 6'!!! Another big accomplishment were the ceilings. Although they were beautiful wood ceilings, they weren't insulated. Yep... they were the roof! My wonderful soon-to-be cousin, Robert, had the idea of creating a false ceiling. This would do two things for us - allows to to insulate and give us lights! Did I mention there are no lights on the ceilings in any room (other than the master bath) because the ceiling was the roof? It was a problem. The only way to get light into the room was to plug a lamp in and use the switch on the wall to turn on the light. It was a problem. With the false ceiling we are now able to add lighting! And, as an added bonus, it provides more structural support! A view of the new false ceilings. That was where it stood when I left Friday (I was there Wednesday - Friday). Colton and I cleaned up and then I got ready to head back home. Before I left, my other cousin, Paul, stopped by the house (yes, I have A LOT of cousins and we love to help one another) and we decided we would have his business partner level out the front of the house and remove the stumps. It was quite the chore but man does it look good. Last week was the first time I left the house and thought "ok... we are making the turn between destruction to construction." As I type this, my wonderful baby brother and his crew are at the house hanging sheetrock for me. You may wonder why my baby bro is doing it - well let me tell you. I had someone scheduled to do the work and he called 4 days before he was supposed to start and said he didn't think he could do it. I spent the next two days calling people, having them come by and quote it and do you know not a single person called me back. Not one. I was majorly stressed and figured I will just do it myself. And then my brother stepped in and said he would take some guys and do it. And yes, he lives 6 hours away, too. He is such a good brother!!! I will be back up in 10 days and that is when the finishing work will be done - the paint, the cabinets and THE FLOORS! I'm so excited. We have had so many delays but I feel like we are getting there. Of course, we still have the front part of the house to deal with (the garage and covered breezeway) but we have to wait for a permit. We are looking at another 3 - 4 weeks until we finish but the majority of the work will be finished in the next two weeks! Woo hoo!